Do you love bikes and want to see a whole mess of biking folks in your community or have bike lanes everywhere? Do you love to dance and want to see dancing used to bring people together or as a way to let completely go? Do you love to learn and want to see learning happening in new and creative ways in your city? Do you love nature and want to see it worshipped and cared for in all the best ways? Do you love street art and want every city wall downtown to be a giant mural of some rad artist’s view of the world? Whatever it is, you have the magic to do or be part of something bigger than yourself. So I went through this whole phase about thinking about how things change. I wrote about it here if you are up for a story! Change kinda makes me nervous in some ways, especially when the need is big or feels beyond my reach. I start running around in my head trying to figure out what I should do, where I fit, wonder if I fit, worried we have to start NOW…and then I just want to take a nap. And I start to feel sort of small, which is a tricky place to be because it usually means you have lost your power, knowledge or hope along the way too. But over time, and not nearly enough naps, but lots of soul searching and head shrinking/expanding, I realized almost everything good starts somewhere with someone believing it may be possible…and believing in the people around them, seeing and claiming something no one else has yet. The magic is in the person who can start, in some small way, to claim and step into a city or life they want for themselves and the people they love. Magic is created in even just starting to imagine what can be. I know now it all matters, each step we take, no matter how small. It seems the best way to make that first step to create something beautiful is to play and start in the place of something you love. This kind of change and living is the kind that grows from the bottom up, it rises in the raddest ways, out of joy. So I found some old magic wands while cleaning one day, I know, this is my life. I had ordered them for a project and had forgotten all about them. I wondered if they might be the perfect thing to leave in interesting places to find out what other people loved about the city and their thoughts on change. 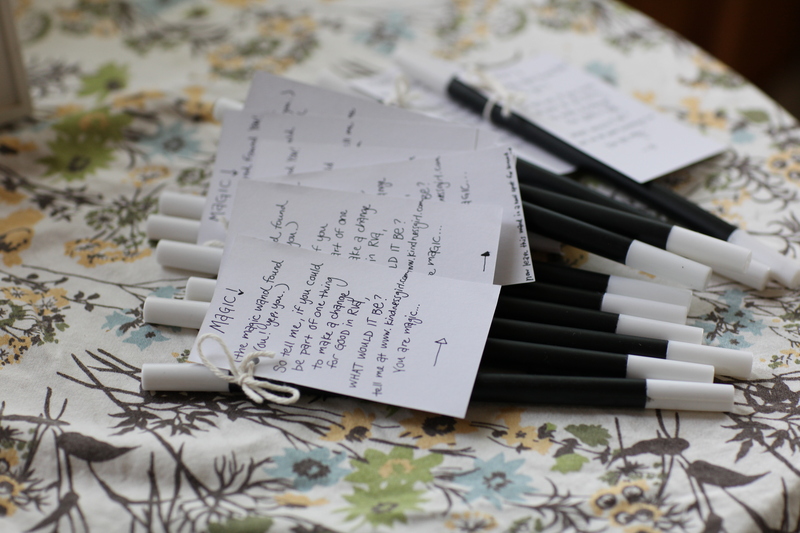 I attached a note explaining the project to 100 wands and sent them off with dear friends and fellow kindness workers to litter the city with those bad boys of goodness….and waited to see if anyone is interested or has any magic to share. For me, I want to be part of art and kindness changing the place I love and connecting people. I want to make stuff and do lots of guerrilla kindness that let strangers and my community know there is joy and love in the world and that they are cared for and not alone…and invite them to pass it on if they feel called. So now maybe your head and heart are filling with ideas, or you have no idea and need to think more about it or maybe you need to go take a nap, but either way, it all counts and thanks for being part of this project. Thanks for thinking about what you love and the city you live in. It’s all MAGIC. p.s. even if you didn’t find a wand, we would love to hear your answer…and if you know of a program or some way to connect a love mentioned in the comments with a point of action, please speak up! Also, if you want to start a magic wand project in your city, here is a download of the tag to attach to your magic wands! p.s.s. 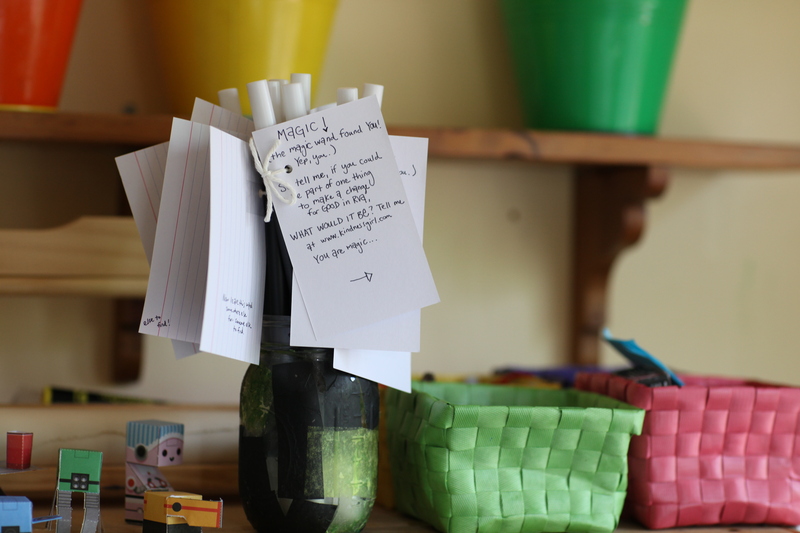 you may also want to check out The Magic Wand Project for kids! LOVE IT! I was wondering if it would be okay to change the text but leave your design, so that maybe I could set something up for my city (Lynchburg). I am currently taking a social psychology course, and I can really see how these efforts you make translate into changed attitudes and joyful moments for many people. Small shifts can make us see things in a whole new light. You are wonderful! Hello!! Just found a wand 🙂 a friend and I were walking by the canal walk downtown Richmond and a wand was just sitting on a rock waiting for us. This is seriously the coolest thing and we are still laughing and smiling!! We carefully chose an awesome new location for it at Main Street station. If I could be part of one thing to create good in RVA it would be community gardens. People could plant, tend, and harvest and work together. 🙂 I cannot say enough how cool and positive this idea is!! I went past the Main Street station a few hours later and it was gone! Maybe it’s found its way to another town!? Mylo – I play ukulele and sing (both poorly) in front of people, from time to time. I’d be willing to do so in this hypothetical show. Or on a street corner. Either one would be fun with you, I suspect. Let’s put on a Magic Wand concert! Jen in blk mtn. Found a wand in front of my deli on cherry st. Theres not enough kindness in the world. I try to teach my children to be kind to others everyday. Hopefully creating a next generation of caring, giving adults. Create “good” I would love to more volunteering in our schools. there are sooo many kids who need a hand and someone who just cares. I found the magic wand when I returned to my seat in the Carytown Starbucks early yesterday morning. As a part of my effort to create GOOD in RVA, I am working to make Richmond, Virginia a world-class city that surpasses New York, Moscow, Paris, Rome, London, etc., etc. I was surprised and delighted to find the wand outside Black Swan Books on Main St. yesterday. I read about the project and think this is a fantastic idea. I plan to release my wand tomorrow in Carytown. I’ve given a lot of thought to how make RVA a really great place, and I think I would ask everyone to get acquainted with their two closest neighbors, and if they already know the two closest, pick the two next closest. We all live such insular, busy lives: we know our social circle (and our kids! ), we have our church and work colleagues, but because of the way we live today, we often don’t know the people who live around us! It shouldn’t take another hurricane or natural disaster to get to know our neighbors – and you just might find in that acquaintance someone who really needs you, or someone you really are very glad to know yourself! Found a wand at Ellwood Thompson’s! If I could be a part of something good in Richmond, I would love to participate in a monthly Critical Mass to promote cycling in Richmond! Found a wand in front of Police Headquarters, great place. I think for both Richmond and Henrico to relax the distance requirements for owning backyard chickens would create so much good on all levels. Now to choose a good place for my wand, maybe spread the joy to the County? I do a lot with my church’s youth group as an adviser and I would love to see more done about marriage and racial equality. Our church does a fair amount in these areas, so I will just keep doing. Magically a wand found its way to my work desk in Black Mtn, NC. I have no idea how it got there. The one thing I’d be a part of to create good would be a meditation group. Being in the moment is good for the world. Love this wand project idea. Hello… I found my wand in Bellvue on a table outside The Mill.. Was so excited to see it and cant wait to “leave” it somewhere.. What would I do to create more good in RVA?? Im already doing it… I teach childrens yoga and am helping them to learn to live stress less.. Sharing with them the importance of being kind to themselves, there family, strangers, animals and the earth… Also.. smileing at all people all the time. You never know when it will change someones day. Hey. Im down in Asheville, NC. Ive been to Target maybe twice in my life. Im not a big box store person…Im more of an anti-capitalist earthy type…I dont have dreadlocks but I might as well when you stand me next to the average Target customer. So the one time I go, with my 15 month old god daughter, we find this wand outside. She liked playing with it, so that’s a score right there. I’ll let you know when it moves into its next stage. Someone placed a wand on our car tonight while we were eating out in Clayton, NC. This is a great idea and really gets you thinking about how to make your community a better place. Looking forward to leaving it for someone else to find, and maybe even hanging around to watch them find it. I found my wand near Once Upon A Vine on MacArthur Ave. in Richmond’s northside. I wasn’t very original so I left it in the same place for the next person to find. If I could do it, I’d like to have Henrico and Chesterfield counties work together with Richmond for the betterment of all citizens in these areas. If I could be part of one thing GOOD in RVA- it would be to expand the community gardens and organic, healthy food to LOW-INCOME communities. I love seeing the gardens everywhere- but they are all in the up & coming neighborhoods or in areas where people can afford to pay high prices.. I think the Tricycle Gardens (Southside) is doing a fantastic job being visible and available where they are on Bainbridge St. I just want my neighbors can have as much access to good food as myself. The “magic” aspect of this appeals to me greatly as doing reiki feels a little like magic. So in that spirit, the new good thing I’m doing is beginning a reiki circle for other practitioners in the area so we can inspire and learn from each other, making us better agents for positive change in Richmond and beyond …one healing at a time! I love your project! What a wonderful thing to randomly find a wand! I’ll take mine back out into the community later today! Thank you for this! I was given the Magic Wand today and wanted to respond. To have a fun filled day for young children to be exposed to books whether new or used and receive a free one of their choice while listening to many different storytellers. It always breaks my heart when I see children struggling to read. I believe being exposed to reading not just for school but, pleasure too is a wonderful gift from God. I’m passing the Magic Wand forward! Hello! I found a starfish wand just a few minutes ago at Oyster Pond in Chatham, Massachusetts. We came home to write a comment here, and are going into town again in a few minutes to place the wand for someone else to find! This is really neat. To answer your question about what I can do to create good, I can smile at someone. Hello again! A minute or so after I placed the FIRST wand I found a second one! I ran back to check on my first, and it was still there. Wow! Thank you! This was REALLY fun! To answer your question about what I can do for more kindness, this time I can be nice. 🙂 I placed the second wand this afternoon, also. Found this wand in the library after the librarian said that there was one in the library. And then I hid it somewhere else outside the library and we sat on a bench watching people walk by it. People kept walking past it and then a child found it, and his mom said to put it back but we ran to tell them that they could put it somewhere else. To answer your question about what I can do for more kindness, I can be funny and make people smile. I just found a wand in a sandbox where I work! I’m an intern at the Monomoy National Wildlife Refuge in Chatham, MA. I was sitting at the front desk and briefly glanced at the exhibit room to my left and saw something pop out from the sand that usually isn’t there. It was colorful! I walked over, someone had built a small sand castle covered in our shells and mounted the wand on top. The wand has a sea star and colorful string falling down sea star. I’m so happy right now! This seriously made my day. I can’t wait to find it a new home. 🙂 Thanks so much for the inspiration. I found a wand in front of my house in The Fan a couple of months ago. I was really excited because I had already read about your project on your blog. Then I saw a group of school children walking back from a field trip from the VMFA and I got excited and thought I should let one of them find it. As they walked by they noticed it but their teacher told them not to touch it. Understandable. I took it as a sign that it was really meant for me at that moment. I have a ton of ideas for Richmond. I’m not so great at executing them. One thing that has been on my mind for as long as I can remember is the big elephant in the room. Race relations. I want to create a movement for Redemption. I have always know that my family has been in this area since before the Revolutionary War and that my ancestors probably owned slaves. While researching my ancestry I found a tax record of my great great grandfather’s slaves and seeing it made me feel as if I had just been punched in the stomach. The nameless people listed as property was sickening to see especially connected to my people. The fact that their descendants can’t do what I was doing in my research because they would hit this nameless “wall” made me feel horrible. Also the disgusting act of owning other humans and my concern for how these five people on my ancestor’s tax records were treated just made my head spin. How can we make this right? First we have to understand that this still has a profound affect on African Americans of slave descent and Richmond is full of this history. I want to create an organization of descendants of slave holders who want to apologize, make amends, create connections with descendants of slaves, help them research their ancestors, let them know that I worry about how Monument Avenue makes them feel and that I worry about how protestors carrying the Confederate flag in front of the VMFA makes them and their children feel. I want other white people to really think about how this affects African Americans. I want to apologize and actively make amends and I want others to join me. It would be so great to start this in Richmond during the 150th anniversary of the Civil War. Thank you for your kindness and your wonderful project. Fingers crossed this comment finds you, so you can be reminded of how many people benefit because of you!!! My daughter hid a kindness wand in my shoe. I am working to gather people in my area to provide an amazing night once a month for foster kids so they can have a great time doing various activities, play games and eat awesome food while also giving their foster care parents a much needed date night. I think this is a great way to serve families and help release more support and goodness to our city. I LOVE this idea, along with several others of yours! I live in St. Louis, and we need something like this, so I think I’m going to start it up. Thank you for the inspiration! My name is Ashley Harmon and I am the Region IV Vice-President for a student run organization called SkillsUSA Virginia. Every year we do at least one community service project and when I heard about The Magic Wand Project, I knew that it would be a perfect project for us. I would like your permission to do hold Magic Wand parties and promote the Magic Wand Project state wide through SkillsUSA Virginia as well as through my local chapter in Blacksburg,Virgina. Sure Ashley!!! So happy to have you all be part. Can you please list attribution at parties and publications? Thanks! !